The movie Alien has been considered the first Sci-Fi horror. Its main star, the Alien, is completely different and more lethal than any other Aliens or creatures ever seen before. Its creator H.R. Geiger, was the creator of the Alien and its hive. The Alien movie has had three sequels which are unique in their own standings. The Aliens have moved off the screen and onto the toy shelves. The first Alien toy was produced by Kenner in 1979, and stood a fearsome 18 inches tall! The figure was so "scary" to children, that it was pulled of the shelves. I talked to one person who said he had to stop before he got to the Alien figures in the aisle, and then run around another aisle to see the other toys in the first aisle, because he didn't want to walk by them! Such a statement for a toy, is rewarding to us collectors. But on the other hand, Kenner had to dump its 4" 1/2 inch Alien toys which were to follow the 18" tall one. To be produced was Alien #1 w/ Sliding inner jaw, Ripely in Lieutenant outfit, Ripley in Mobeius Outfit, Dallas & Ash. 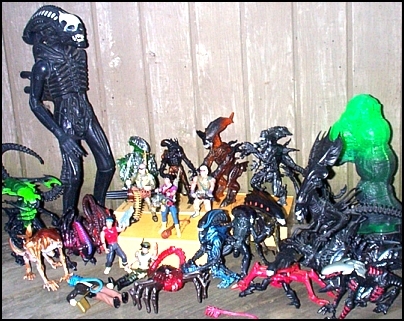 Aliens were finally brought back to the stores in 92' with a whole new toy line. Produced by Kenner again, the line added a twist that the Alien would partially resemble it's host. This idea may have been spawned from a early version of the script of Alien 3, the "Dog Alien". As for the Marines, Humans & Androids, they were loosely based off the characters from the Aliens movie. The line continued for 3 years until it's demise. A total of 24 Marines and Aliens, and 4 vehicles were produced for the Aliens series. Yet Kenner still has a demand for Aliens figures. Kay-Bee has been working with Kenner and bringing out re-hashes of figures exclusively for Kaybee over the years. One Kay-Bee exclusive series included the UK only Marines which included Vasquez and Hudson. They were produced in 2 packs with reissued aliens in new color schemes. The most recent line is "Aliens Hive". This line was probably the most exciting for collectors because Kenner finally issue prototype figures that were meant for the original line, but were never produced. The now produced figure list is of the Alien Drone, Poseable Jaw Predator and the Night Stalker Predator. Kindly enough (to prototype collectors), Kenner did not produce the Space Suit Predator Marine or the "Bull" Alien. The Aliens saga continued with the highly detailed Alien Resurrection figures. These figures are exceptionally detailed, but need work on having the figures stand up! Kenner produced 6 regular figures, a Walmart 12" drone, a Japanese Exclusive "Green Alien" which is limited to 5,000. Japan also released a little later a "Clear Alien" which was limited to 3,000. With the fan following of Aliens and continued sales of the figures, it seems more Aliens toys are not to far down the road. Who knows what other Aliens figure may arise from Kenner? Is Alien 5 in works? There are so many rumors and only Fox knows!